Bradley, F. Writing for the profession: the experience of new professionals. Library Management 2008, 29(8/9), 729-745. This interesting infographic looks at the idea how digital technologies will increasingly shape the classroom. It considers the use of textbooks vs. e-books, book rental options, e-book readers and the customising of textbooks by students. It also considers how classrooms become generally digitally empowered through the proliferation of interactive handheld devices, which are used by students and teacher alike. Access the full in infographic here. The Journal of Creative Library Practice (@creativelibprac) is a new open access journal which was launched earlier this week. However, at first glance it looks more like a blog, it uses Wordpress CMS, and the author guidelines even state that articles will be published as a "blog post". Content will be published as soon as it is ready, rather than being held back for the rest of the issue. The relaxed referencing requirements are also welcome (and it would do some other publications good to take note). Whilst articles will be peer-reviewed, the journal's review policy will be similar to that of PLOS ONE, where the "peer review process does not judge the importance of the work, rather focuses on whether the work is done to high scientific and ethical standards and is appropriately described, and that the data support the conclusions". So a journal that looks like a blog, or a blog that looks like a journal? Either way, what we see is a blurring of the lines between both platforms that poses some interesting questions. From the reader's perspective, I am not sure how well longer articles will work as blog posts. Whilst web pages can be converted to pdfs and ebook formats now using web apps (there are also tools like Readability which can help), this is an added burden for the user compared with simply downloading a ready made pdf. I would perhaps encourage the editors to also offer a pdf option alongside each post. I wonder if, and how, the posts are being archived as well. That said, packaging the journal in a more blog-like format will likely open it up to a new audience who do not typically engage with scholarly publications, and may even encourage them to undertake and publish their own research in a less threatening and more inclusive venue where they have a higher chance of being published. Ultimately though it is an example of a new slant on traditional dissemination - and something we may see a lot more of in the future. A few weeks ago I attended a handy morning workshop which talked about FRBR (Functional Requirements for Bibliographic Records). FRBR facilitates a more holistic approach to accessing and retrieving bibliographic records from a user's perspective when interacting with a library's OPAC. It represents a conceptional entity relationship model that considers three interrelated group entities: Group 1 (products of intellectual and artistic endeavour), Group 2 (those responsible for intellectual & artistic content) and Group 3 (subjects of works). FRBR thus acknowledges and expresses the multi-faceted relationships that exist between these entities and their relevant attributes (metadata). Take a look at what the Open Library throws up when searching for "Romeo and Juliet". The result exemplifies the application of FRBR. The following list of references was given to us for follow-up and further study; you might be interested in this too. Understanding FRBR : what it is and how it will affect our retrieval tools / edited by Arlene G. Taylor. -Westport, Conneticut; London: Libraries Unlimited, 2007. Implementing FRBR in libraries: key issues andfuture directions / Yin Zhang and Athena Salaba. -New York; London: Neal-Schuman Publishers, 2009. Introducing RDA : a guide to the basics / Chris Oliver. - London : Facet Publishing, 2010. Practical cataloguing : AACR, RDA and MARC 21 / Anne Welsh and Sue Batley. See also the previous post on RDA. 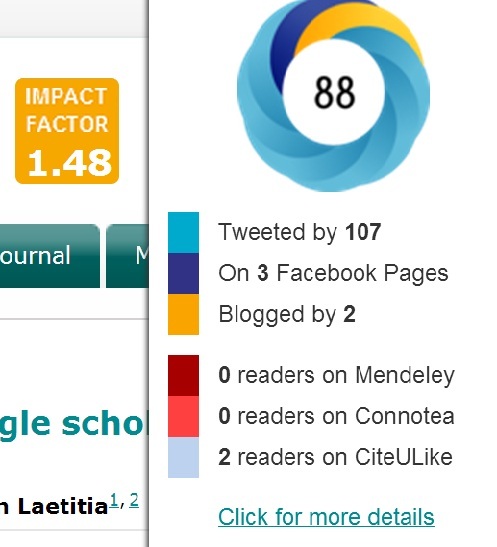 I have been using the Altmetric It Bookmarklet myself for a while now, and more recently as a really useful and quick tool to demonstrate to researchers the importance of thinking "outside the impact factor" and traditional citation metrics. Talking about twitter and social networking tools is all well and good, but nothing hits home to scientists like hard data and numbers. Using the doi of an article, the Altmetric It Bookmarklet will tell you how many times it has been tweeted, blogged about, shared on facebook, added to Mendeley and more. Impact is not just about citations! Take an article I have been using in workshops recently to explore the Google Scholar v PubMed idea, Is the coverage of google scholar enough to be used alone for systematic reviews (doi:10.1186/1472-6947-13-7). It was only published last month online (so too soon for any citations to have filtered through) but has already been tweeted by over 100 different accounts. Showing researchers these numbers highlights the value of using tools like twitter to share and disseminate research. Many people, such as industry practitioners, will probably use and apply the findings of your research without ever citing it. This usage still represents impact. You can also get a detailed breakdown of who is sharing your research through the 'more details' link, which opens up a wealth of opportunities for connecting with others. However, altmetrics not only capture usage and impact in the social space, but may potentially be an interesting leading indicator for citations. I would love to look at the latter in more detail and explore the correlation between early tweeting/sharing and citations over time. The 40-minute long tutorial below introduces and summarises quite well how to interact with, and get the most out of, various Google resources including Google Scholar (the first 20 minutes), Google News (+ archived newspapers), Google public data explorer, Google Videos (searches all of Youtube and other video sites) and Google Books. The tutorial also introduces the handy Google Alerts and highlights the Google Search Box, which enables you to add Google Scholar custom searches to your website. I'm sure that most of you are in the know about Google's wee research helpers, but this video is particularly helpful in supporting teachers/librarians who want to introduce their students to these services. However, at this junction it is sensible to ask yourself whether it's actually a good idea to recommend Google Scholar to students in the first place (a judgement call of preference I suppose). Subscription databases are generally preferred by librarians. And that is because Google Scholar is a search engine and not a bibliographic index of previously published, peer-reviewed works (the top publications list is helpful here). As with everything else on the Web, it's prudent to check whether the search results are accurate and authoritative. Google Scholar could be seen as an extra tool that supports a student's overall research effort. But, it goes without saying that search results ought to be critically appraised and then used accordingly. A sensible approach would be to be open minded here and include Google Scholar (and other services) in formal information literacy classes, which would empower students to use such extra resources sensibly and in a state of conscious awareness. Ronan’s previous piece on how to become a Google Power Searcher fits neatly into this context. Although I was not aware of it until now, since discovering the ANCIL model a year or so ago I have been waiting for a book like this to be published. ANCIL is influenced by a body of literature that will be familiar to many, including a weighty nod to Biggs’ concept of constructive alignment (Teaching for quality learning at university should be on everyone’s bookshelf in my view! ), and overlaps with well-established standards such as the SCONUL Seven Pillars model. 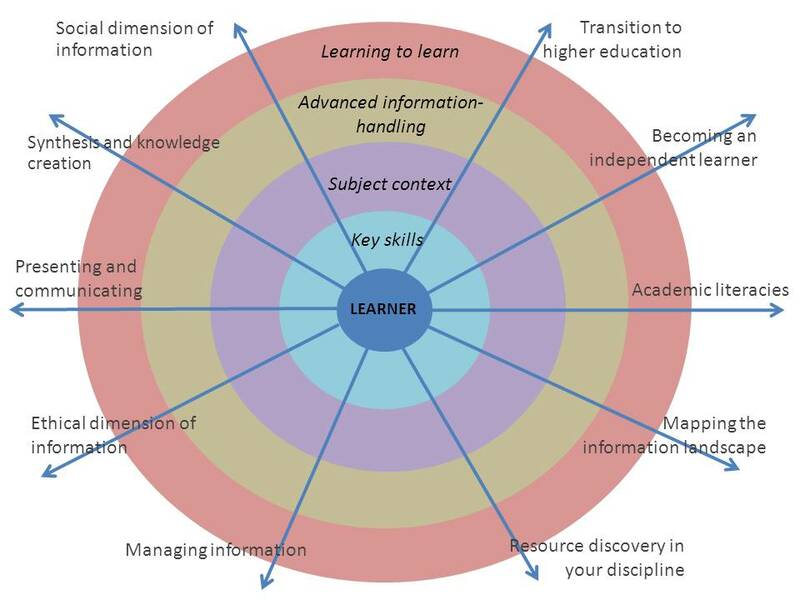 The diagram below best encapsulates the essential structure behind the curriculum itself. 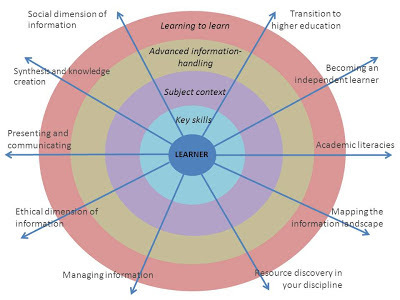 Across each strand there are four broad levels through which the learner can progress. The strands also represent a continuum of skills and behaviours around information rather than separate or isolated competencies. The model has been previously published and is freely available to access, so you don’t need to buy the book if you just want to see the outline of the curriculum itself. However rather than simply restating the model, the book is constructed around a series of case studies written by leading practitioners who discuss how they deliver and implement the strands of the model in practice. Whilst each chapter makes careful reference to the underlying pedagogic principles and learning outcomes, this is very much a practical book. The reader comes away with a wealth of ideas In terms of teaching, learning and assessment activities, with which to flavour their own instruction. Sarah Pavey discusses innovative activities to help school-children develop the necessary skills for 3rd level education. Geoff Walton & Jamie Cleland design a module centred on peer-review and feedback to support independent learning and the challenge presented by students who ‘know already’. As a health science librarian, Isla Kuhn’s application of teaching resource discovery to medical students was a personal highlight. Kuhn outlines how she delivers instruction on systematic searching, managing information and keeping current using a constructivist approach. However, those in other disciplines will also gain immense insight from her approach, and no doubt it will be a well-thumbed chapter by the faculty and subject librarians. Elizabeth Tilley discusses the Managing Information strand in the context of delivering Zotero workshops to both undergraduates and postgraduates. The structure of this chapter really draws out the structure behind the ANCIL approach, whereby the specific curriculum content is directly informed by user needs, relevant pedagogical theory (for instance Kolb’s Experiential Learning), and the format and timing of the sessions. Tilley also provides a useful grid template which may help others design and plan their own instructional activities. After reading the book, I felt I had a toolkit of really practical ideas that I could adapt to my own instructional context and start implementing straight away. The structure of the book also facilitates both detailed reading and quick reference. For instance, you can quickly dip into a relevant chapter for a refresher and some inspiration before delivering a session based around one of the strands. Perhaps one of the most valuable messages in the book however, is the need for information literacy instruction to be truly inter-professional, to the extent that the editors actively recommend passing on the book to teachers, lecturers and policy-makers. Librarians must recognise that they are not the “owners” of information literacy, and instead present it as a shared endeavour of direct relevance to the strategic objectives of the organization. Without such integration it is likely that the efficacy of our information literacy efforts as librarians will remain limited at best. This is just one reason of many why this book is an essential purchase for anyone involved in supporting learning and information skills. Rethinking Information Literacy is published by Facet, December 2012, £49.95. 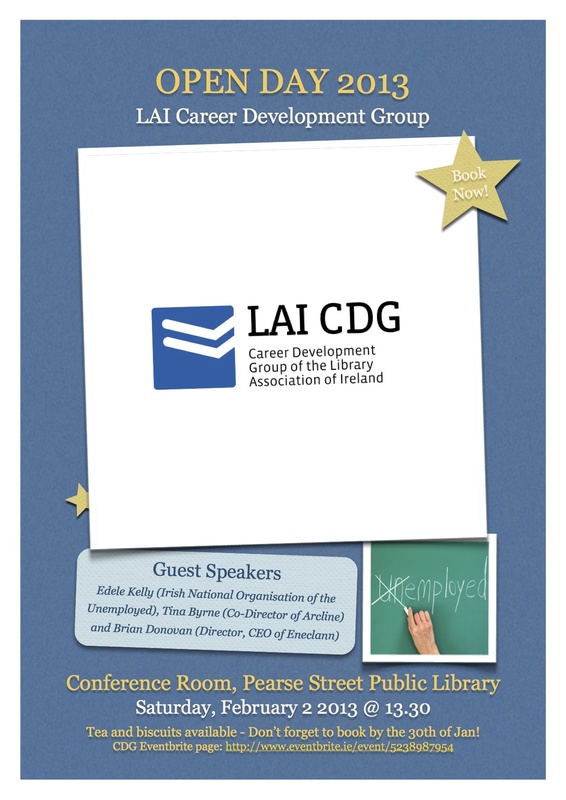 On Saturday 2nd February, the first event organised by the newly formed LAI Career Development Group took place in Pearse Street library. The 'Open Day' provided a platform for the three speakers to illustrate that the role of the qualified librarian, the newly graduated MLIS and current students are invaluable to a wide variety of sectors within Ireland. First up, Edel Kelly from INOU - Irish National Organisation for the Unemployed gave an insightful introduction to how to apply for the various supports available. Her presentation was titled 'Options & Opportunities for Unemployed Librarians & Information Professionals'. The role of the INOU is to assist people in moving from welfare to work as well as providing information on how to become self-employed for contractual employment. A strong point made by Edel was the fact that we shouldn't take no for an answer. Not every civil servant behind the desk knows all the information - so make sure to check what you are entitled to before you visit. Use your search skills. We are the Info Pros - so make sure to keep a record of who you have contacted and what jobs you have applied for. Not to mention keeping a record of any response or lack of from those applications. We manage others records, so the top tip is to ensure that you keep good records of your own job seeking. If you decide to go down the self-employment route - taking on contract work or starting up your own business - check out all available financing options. One of the great features of #cdg2013, was that during Edel's Q&A session, some helpful points came from the floor - us Info Pros just love to share information! So do check out the Back to Work Enterprise Allowance - BTWEA. and another top tip for current MLIS students - you can apply for job seekers allowance from April, once full time courses have finished. 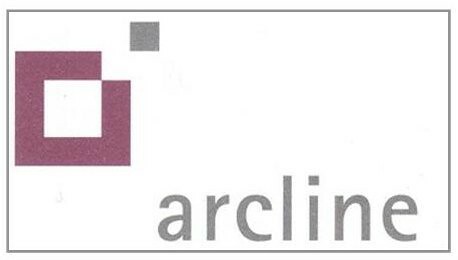 Next up after the coffee break was Tina Byrne from Arcline a document and records management company established in 1996. 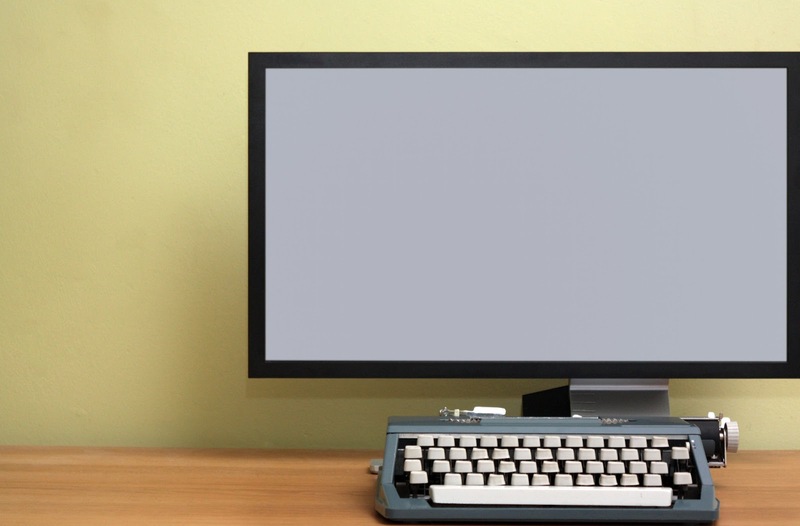 Originally comprised solely of archivists, they have developed into offering the services of librarians or information professionals within their project work. Fielding teams that can comprise a mix of experienced and the newly graduated information professionals and archivists they take on projects that require a variety of skills. Arcline secure contracts mainly in the September 'tender' period and projects can be for as short as two to six weeks or as long as a year. They recently had a team of twelve working on a project for the Houses of the Oireachtas that took a year to complete. Transferable skills from the world of the librarian such as MARC21, AACR2, LCSH and LMS experience, alongside the ability to meet deadlines are required within their project work. Whilst most projects are Dublin based, they do get requests for outside the capital. The other key skills required are team work, initiative and excellent communication as you may be working with unique collections in limited timeframes. Tina was very keen to hear from the Info Pros in the audience, so send your CV if you are available for work and also indicate that you are prepared to travel if positions become available outside of Dublin. offering a selection of services including but not limited to research, digitisation, archive and record management as well as digital publishing. Working with combined partnerships they have developed online projects such as Findmypast.ie. Thus making available online valuable resources such as prison registers, petty session records, and the landed estate records.The digitisation of the Petty Sessions records is a large ongoing project. Another major project involves the records related to the Irish Revolutionary Period 1912-1923 - the medal records alone are providing a vast amount of information especially in this decade of anniversaries. As with all digitisation projects, the information uncovered can provide a great insight into life in Ireland during this period, and can shed a light on the more human aspects of history. Details from the prison records such as physical description, tattoos, next of kin are valuable aspects to family and social research. Brian offered some excellent advice, echoing Tina from Arcline, we should be positioning ourselves as the Information Professionals. Digistation is where Eneclann are expanding and there is a role for librarians in making more material available. Info Pros with cataloguing and digitisation experience are valuable assets for Eneclann and the fulfillment of their provision of public access to records. Another call for librarians to get in touch with Eneclann regarding their future projects, matching their skills to work. There was so much for us all to take from the first event from the Career Development Group #cdg2013 - Giada as Chair thanked all the participants for making the day so successful and interesting. Keep an eye out on the blog, Facebook and Twitter for more information on forthcoming events organised by the group and please get involved. Many thanks also to those who 'live tweeted' during the event - it really was a great success both in Pearse Street Library and online.